This is a 7-week plan with balanced programming to concurrently train strength, work capacity, chassis integrity, and Endurance. 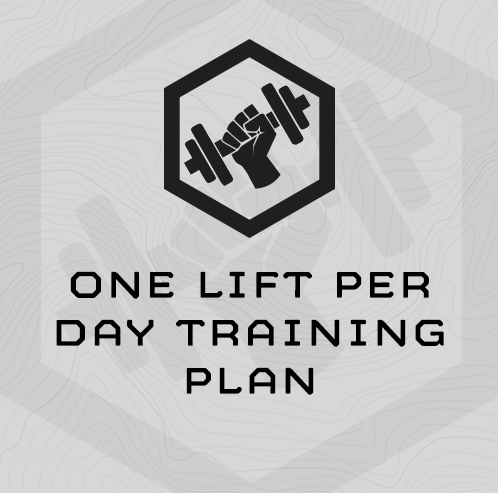 The plan deploys a modified version of MTI’s 1-Lift Per Day programming approach. You’ll complete these sessions 4 days per week and run unloaded on Wednesdays. The 1-Lift Per Day approach generally trains strength, work capacity and chassis integrity in the same training session. This plan includes these sessions, and also a session which trains both strength and gym-based endurance. Four days per week, you’ll begin the training session with a barbell-based strength exercise – this is the “one lift per day” you’ll complete. Strength exercises will rotate through Total Body, Lower Body and Upper Body exercises. Work capacity efforts are all designed to last either 10 or 20 minutes. You’ll complete 20-minute ART (Anti-rotation, Rotation and Total) Chassis Integrity circuits and 10 minute Low Back circuits (3 low back or extension core exercises) 3 times per week. 6-Mile Running Assessment and follow-on 2-mile intervals based on your most recent assessment results. You’ll run 6 miles for time at the beginning, middle and end of this 7-Week plan. If you’re interested in the programming theory behind this plan, view this video in which Rob explains the beta-version of the theory. Fully-equipped functional fitness gym to include barbells, bumper plates, racks, bench, plyo-boxes, sandbags, dumbbells, etc. 12x Hippity Hops @ 16"
3x Box Jumps @ 24"